It’s that time again; harassed parents across the country are scrambling to buy new shoes for their children as they begin a new school year. My children are particularly difficult to buy for as they both have narrow heels, and have to have properly fitted shoes or risk stepping out of them every time they walk. This year I tried something different with my eldest child, who’s 7. I’d already had to buy her new trainers earlier in the holidays (it turns out that trainers don’t survive a thorough dunking in mud followed by a good long paddle in the sea. Who knew?) so when I was asked by Start-Rite if my daughter would like to try a pair of their shoes I was over the moon. I remember having Start-Rite shoes when I was a child but was startled to discover that the business started at the end of the 18th century. These days they sell through a variety of outlets, including independent retailers and online, but their aim seems to be the same: to supply quality, comfortable and stylish shoes. Because of the aforementioned trainer incident I knew my daughter’s shoe size and width, so it was easy to order the right shoes. My daughter chose a pair called Princess Elza, which are made of black patent leather. 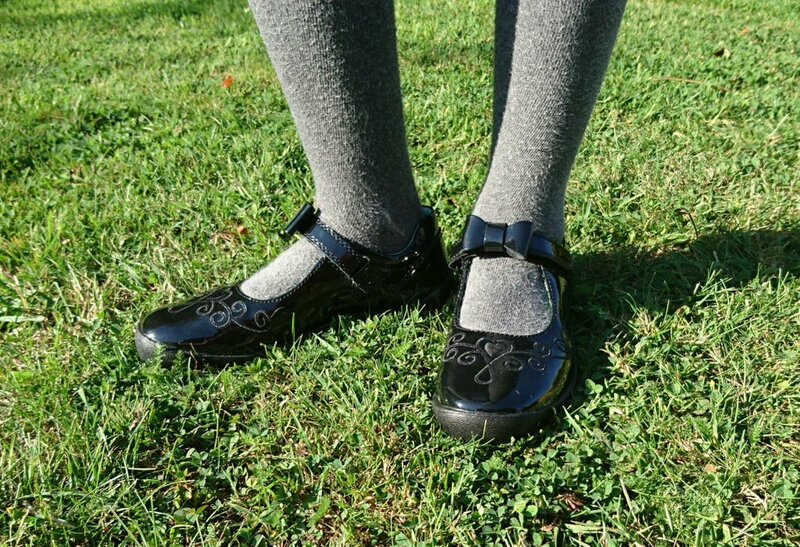 Normally this would put me off as nothing gets scuffed faster in the playground than patent leather, but these shoes have a scuff-resistant bar across the end of the toe which gives me hope that they may survive at least one term! The Princess Elza shoes have a velcro fastening with interchangeable decorative charms, which I thought was a nice touch and my daughter was thrilled by. The inner sole is cushioned at the heel but still supportive, and the ankle area is nicely padded to prevent rubbing. The linings are made from breathable textiles and are a pretty green colour, which makes a nice change from the usual dull black. The outer sole is firm but allows the foot to flex within the shoe, which is important for the development of a child’s foot – after all, they’re not fully formed until the late teens. The fit is very good, with room for growth and a nice rounded end to allow the toes to spread naturally. The velcro fastening doubles back on itself so there’s plenty of room for adjustment. I was very impressed with the speed of delivery; Start-Rite pride themselves on providing free next working day delivery within the UK (on full-price shoes only, I noticed) and this was certainly the case. My only real disappointment is that they still divide their children’s shoes according to gender, but I was gratified to discover that not all the girls’ styles are open at the top of the foot which isn’t always the case with other retailers. All in all I’ve been pleasantly surprised and pleased by this experience and will definitely be using Start-Rite again. The Elza shoe is available in stores and online, in size S9 to L3 and in three widths. 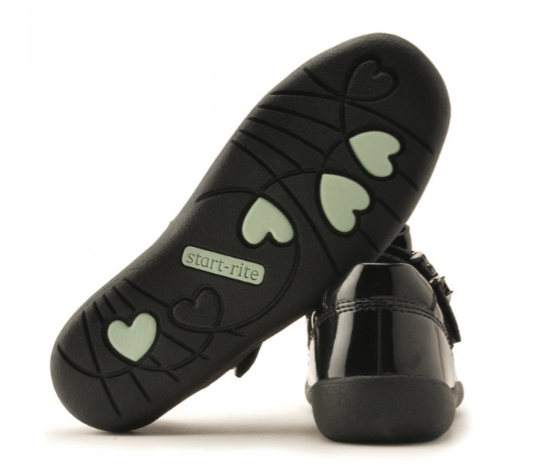 Other school shoes in the Start-Rite school shoes range are available from infant to teen sizes. Disclosure Jump! Parents is a collaborative blog, created by a group of writers. We did not receive monetary payment for this review. Samantha received a pair of Start-Rite shoes to review. Start-Rite had no editorial input into this blog post, and the review represents the personal opinion of Samantha and her daughter. Help! My Child is a Fussy Eater!